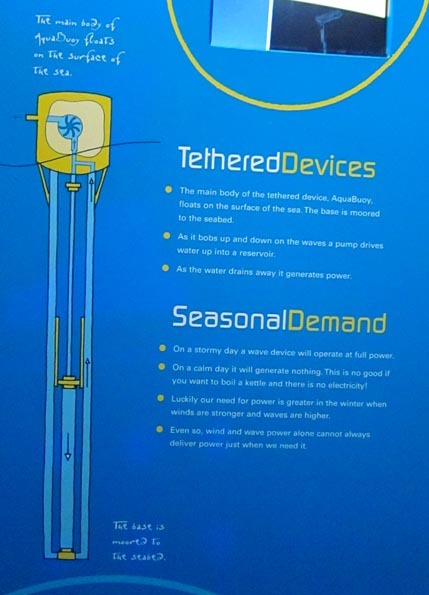 > The main body of the tethered device, AquaBuoy, floats on the surface of the sea. The base is moored to the seabed. > As it bobs up and down on the waves a pump drives water up into a reservoir. > As the water drains away it generates power. 模式図キャプション： The main body of AquaBuoy floats on the surface of the sea. > On a stormy day a wave device will operate at full power. > On a calm day it will generate nothing. This is no good if you want to boil a kettle and there is no electricity! > Luckily our need for power is greater in the winter when winds are stronger and waves are higher. > Even so, wind and wave power alone cannot always deliver power just when we need it.